Young women serving as missionaries today are carrying on a noble legacy of faith and dedication that extends back to the early days of the Church. But who were the brave women who paved the way for modern-day sister missionaries? 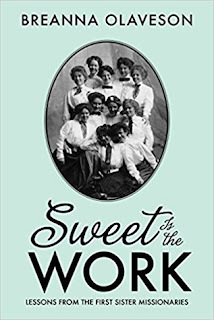 In Sweet Is the Work, author Breanna Olaveson delves into a previously unexplored history that demonstrates the unique ability of women to carry out the errand of angels. Discover the powerful experiences of twelve of the earliest sister missionaries, from the first single proselytizing women in 1898 to some of the well-known sisters in Church history who were themselves pioneering missionaries. The women highlighted in this volume demonstrate the valiant and noble history of sister missionaries in an account that is sure to inspire readers to boldly go forth to share the truths of the gospel. This is a slim volume containing brief histories of the first female missionaries of The Church of Jesus Christ of Latter-day Saints and women who shared the gospel in the capacity of their service. It was interesting to see how differently the church operated in the early days and the evolution of its organization. The trials and journeys of these sisters are inspiring and they are wonderful examples worthy of admiration and emulation. I especially enjoyed learning about Mildred E. Randall who served in the Hawaiian islands since I recently took my first trip there and was able to visit the temple on Oahu and learned some history of the first converts in the visitor's center there. I think the volume would have been more well-rounded if it had included words of testimony from the individuals but instead it focused on historical facts and accomplishments. I missed the spirit that declarations of faith bring. Overall is was fascinating and would be a thoughtful gift to any young woman or sister preparing to serve a mission, as well as a nice addition to your personal gospel library.